The University Museum of Aden was founded in the 1996 by Dr. Ahmed Bataya, an archaeologist who studied in France. 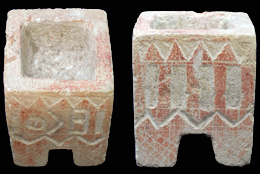 The items collected come from two necropolises, the Qatabanic necropolis of Timna and the Awsanite necropolis of wadi Lajiya. Most of them are therefore funerary objects: stelae, aniconic, with figure in relief, stela bases, some ring seals, and a big offering table dedicated to the god Athtar written in Awsanite dialect. In addition, there are a number of pottery vessels, jars and vases, and some valuable artefacts like decorated capitals and a relief with Hercules represented in a hunting scene. The inscribed objects are about 90. The collection also comprises a wooden stick with a text in minuscule writing that comes from al-Jawf. The University Museum of Aden was inventoried by the CASIS project in November 2008. Photos are courtesy of the University Museum of Aden.